To sign up to the Flexi Direct Holidays Newsletter, simply click the Request Newsletter button below and you will receive amazing special offers, discounts and access to secret sales. Holidays, Flights & Hotels at Great Prices! Travel the world with ease and find deals that are so great you won't believe are real. Explore destinations from, Barcelona, Rome, Australia and Chicago, to Cape Town, Mexico, Olso and so much more. Whether you have the travel bug, want a last minute getaway or are planning a family holiday like no other. The experts at Flexi Direct Holidays can help you get exactly what you've been dreaming about at the best price. 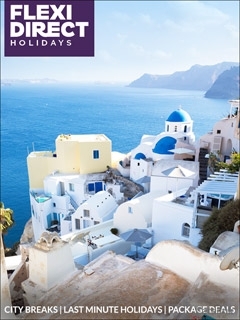 Sign up to the Flexi Direct Holidays newsletter & brochures today to explore their selection of flights, hotels, holiday packages and cruises - choose all-inclusive to keep the family entertained, pick a few short European city breaks to get your culture fix or get that great last minute deal and surprise the whole family! Your next holiday will be stress-free with Flexi Direct Holidays - so what are you waiting for? By Pressing the Request Newsletter button you give Flexi Direct Holidays (and their Data Processors for the specific purpose of delivering your emails) consent to send you their newsletter via email until such time as you choose to unsubscribe.